The F30 BMW 3 Series with M Performance Parts makes an appearance at the 2012 Leipzig Auto Show. The components developed for 3 Series models ensure an authentic transfer of BMW M-specific motor racing technology to everyday driving. This new line of accessories provides a distinctive, sporty character to further enhance driving dynamics. The improved chassis, aerodynamic, cockpit and powertrain components are available for 5 Series vehicles as well. A new 20” forged alloy wheel set (style # 405M) is offered by BMW M Performance for the new for 2012 BMW 3 Series Sedan. These wheels are produced using a special forging process that reduces weight by 1 kg (2.4 lbs.) per wheel when compared to a similar size wheel. A Brembo big-brake kit with painted calipers is also available. The upgrade consists of 4-piston aluminum fixed calipers on the front axle and a 2-piston aluminum fixed calipers on the rear axle. Improved thermal resistance is provided by the larger, internally-vented, lightweight-construction sports brake discs measuring 370 x 30 mm (diameter x thickness) on the front axle and 345 x 24 mm on the rear axle. These cross-drilled and grooved brake discs also reduce water film build-up between the brake lining and the disc surface during wet driving conditions. Painted caliper colors include M Performance Red, Yellow or Orange, any of which contrast nicely with the 20 inch wheels. High-gloss black kidney grilles are available to create a sporty, menacing character for the 3 Series. 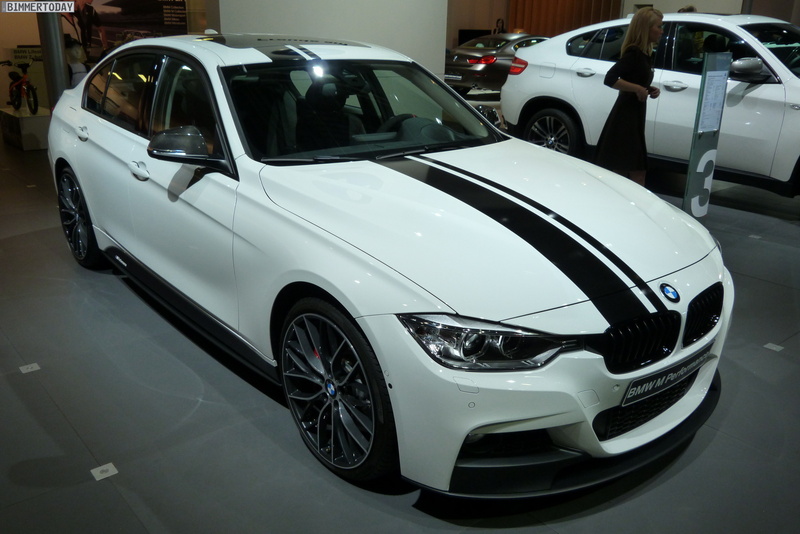 Furthermore, the company offers the unique BMW M Performance Sport stripes. These stripes are printed on high-quality PVC film and are available in black or white. 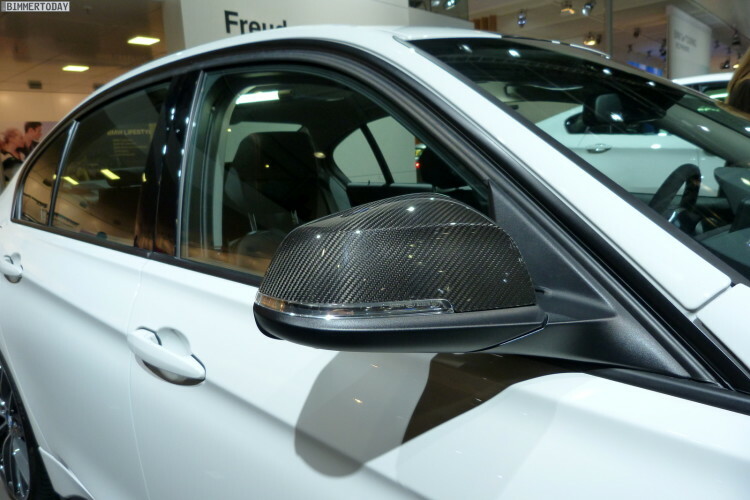 BMW M Performance carbon fiber mirror caps are also available. Inside, BMW Performance a new Motorsport-derived steering wheel, covered in Alcantara, is now included. the 3 Series Sedan. A red stripe is located at the 12 o’clock position to provide a quick visual indicator of steering wheel position. BMW M Performance has made available a seven piece carbon fiber and Alcantara interior trim set inspired by the world of Motorsport. A carbon fiber gear shift knob and selector lever are part of the package as well. Lovers of exhaust sound notes are treated with a stainless steel exhaust system that enhances the sound quality and volume of the BMW TwinPower Turbo Inline 6-cylinder engine. A unique, high-tech look is provided by two chrome-plated 80 mm exhaust tips which are laser-engraved with the BMW M logo. 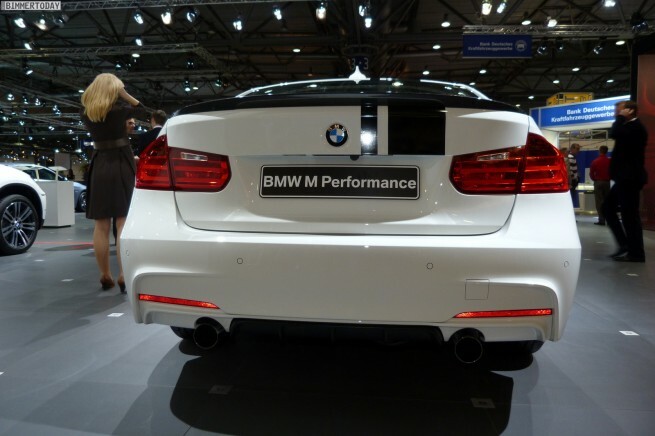 Exhaust backpressure is reduced and a sporty powerful tone is heard with the BMW M Performance Exhaust System (without the droning noise typically associated with some aftermarket exhaust systems). The M Performance Parts package is available in the U.S. as well.